These two live performances combine together two surrealist scenarios into one hypnotic evening that took place at the BBAM! Gallery. 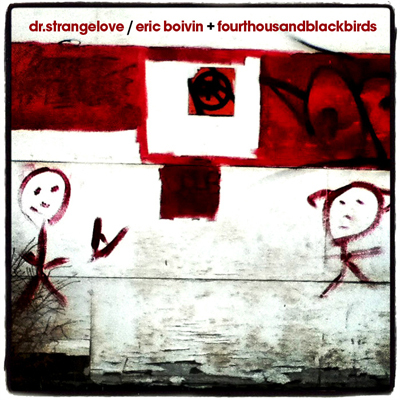 The two performances, while sounding very different on a musical level, are completing each other quite nicely when it comes to the total sensation created by both Dr. Strangelove and Eric Boivin playing with fourthousandblackbirds. It’s a sensation of a dreamy confusion in front of an unearthly vision, finding it both disturbing and soothing at the same time. Dr.Strangelove’s secret for this feat hides in a mystical violin that shakes the entire performance with its power, while Boivin and fourthousandblackbirds’ key is the eerie and oh so familiar sound of a vague and distant ringing phone. This is a great achievement for a live performance. The two groups, with 20 minutes of music each, play very different sets of music while holding to the same conceptual idea. So what can be expected? The cinematic Dr.Strangelove opens this album with a lamenting violin over shifting and vibrating loops, guitars and slow, rusty beats. Somewhere between Moriccone, Valley of the giants and a shamanic ritual, Dr.Strangelove creates a whole galaxy of sounds in this beautiful, vibrant performance. Boivin and fourthousandblackbirds breaks into a an abstract, detached scenario of air-tunnel drones, hospital beeps and distant voices. The nostalgia of the first track transforms into paranoia kept inside a beautiful, alienated field of electronica. “Live at BBAM! Gallery” gives you these two shows for listening and as I hear it, it’s a great release to get to know these projects from.